Gianluigi Buffon was born on the 28th of January 1978 in Carrara, Italy and is a famous goalkeeper for Juventus and the Italian national team, and is generally know as one of the best and finest keepers in the world. Gianluigi Buffon started his career with Parma in 1995. Gianluigi Buffon was born in to a Sporting family. His parents' names are Maria Stella and Adriano. She was a discus thrower and he a weightlifter, so Gianluigi comes from an athletic family. His two sisters, Veronica and Guendalina play volleyball and his uncle, Angelo Masocco, played basketball. He is also a nephew of former Milan and Italy goalkeeper Lorenzo. With this and his entire family’s association with sport, it is in no way suprising that he would choose a sporting profession, and he excelled while playing football. During his inital days playing as a young boy growing up in Italy, Buffon played as a midfielder but later on he decided to change his position to goalkepeer after he lost the will to run, this proved to be one of the best decisions of his life and the on there was no looking back. Buffon was soon signed up by Parma, and immediately made his debut in Italy’s Serie A at the age of 17 against AC Milan. During his debut, Gigi didn't participate in the official match photo, which is tradition at the beginning of matches. He just turned and ran towards the goal, because he was not accustomed to the photocall. Due to his fantastic form for Parma, Gigi was awarded his first Italy cap at the age of 19. It was known later that Gigi was very nervous in this game because he was called on to replace the injured Pagliuca and had seen him get injured. At a certain moment, Gigi also wanted the game to finish early because, as the match was in Moscow, it was very cold and he was wearing his customary short-sleeved goalkeeper shirt. Buffon feared being held responsible if Italy did not qualify for the 1998 WorldCup. Italy however did qualify for the competition and Gigi was chosen for the squad, but did not play in any games during the tournament. Then, after helping Italy through a successful Euro 2000 qualifying campaign, Gigi missed the finals after he broke his hand in one of Italy's final pre-tournament games. He was a member of the Italian Olympic Team at the 1996 Olympic Games then in 2003, he won the Most Valuable Player and Best Goalkeeper awards at the UEFA European Football Awards. Buffon currently holds the world record fee paid for a goalkeeper after his July 2001 move from Parma to Juventus for 36 million pounds. Pelé, a legend in football,named Buffon as one of the top 125 greatest living footballers. When asked about his huge transfer fee, Buffon admitted that it was too much money for one player but says he does not feel under pressure because of it, and he has now joined a select group of great Italian keepers with the Bianconeri after Dino Zoff, Stefano Tacconi and Angelo Peruzzi. After backing-up Gianluca Pagliuca at the 1998 World Cup and missing Euro 2000 with an injury, Buffon restarted for Italy at the 2002 World Cup and at Euro 2004. He was named as the World's Best Goalkeeper in 2003/2004 and moreover, was regarded as the Most Valuable Player (UEFA) in 2004. In 2004/2005, Buffon helped Juventus to their third Serie A title in four seasons. His splendid shot-stopping and stunning saves in a very pivotal match against AC Milan months earlier contributed to them winning the title. In the summer of 2005 during a friendly match, Buffon needed surgery after a clash with AC Milan-player Kaká. Buffon's operation was successful and at the end of November, he was fit and ready to get back on the field to play again. Gigi Buffon in every way has an original talent and this has made him number one for both Parma and Italy in no time, whilst his personality is characterized by great bravery in his statements to the press. Gigi always says and does what he thinks and he possesses a notebook where he writes about the penalty kicks which he has faced, which is a sign of a true strategist. Until today he has kept the red shirt number 12 of his Serie A debut and the gloves that he earned of Taffarel when he was young. 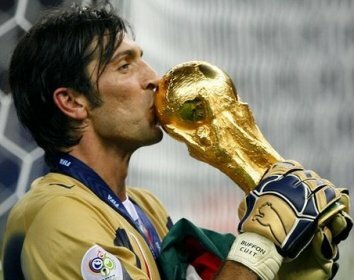 Since 1997 he has been helping his national team, Italy, and won along his team mates the World Cup in 2006 Germany. He received many trophies and honors, among them the Yashin Award, European Footballer of the Year - Silver Ball in 2006, Bravo Award in 1999 or Oscar del Calcio - Best Goalkeeper in 1999, 2001, 2002, 2003, 2004, 2005 and 2006. In 2003 and 2006 he received the Onze d'Or - Best Goalkeeper award. While being at Parma he won the UEFA Cup and Coppa Italia in 1999. His fiancee is Alena Seredova since 2005 and in February 2008 they are expecting their first child. Gianluigi Buffon Biography – Preview - For World Cup keeper Gianluigi Buffon, there's little that could still impress him in the game he's been involved in for what seems like an eternity. Deemed by many as the most complete soccer goalkeeper of our times, a Buffon biography was inevitable on my site, despite the fact that it's a lot harder for a goalkeeper to reach the same levels of fame as a field player. Gianluigi Buffon Biography – Abilities - Usually, it's said that a tall goalkeeper will have softer reflexes, although making up for them through sheer size, whereas a shorter goalkeeper will be more agile. If there was ever an exception to strengthen the rule, Gianluigi Buffon owns copyright for it. Being a tall goalkeeper (6 feet 4 inches), Gigi, as he is called by his teammates, has the hands of a pickpocket and the agility of a gymnast. His lighting fast reflex saves as well as his gravity-defying jumps for the ball earned him the heart of millions across the World. What truly makes Buffon stand out of the crowd (as there are other soccer keepers with good stature and fast reflexes) is his ability to give confidence to his teammates. Although mistakes are inevitable for a soccer keeper, Buffon reduces that error chance to a minimum, being, for my opinion, the most reliable keeper of today. Gianluigi Buffon Biography – Parma - Born in a family of athletes, with his mother being a discus thrower, his father a weight lifter and his two sisters volleyball players, Gianluigi Buffon took up on soccer, soon getting his first professional contract at age 17, from Parma FC. Being sent straight into the hells of Serie A, one of the hardest leagues to play in if you're a goalkeeper, Gianluigi Buffon proved to have a strong mind and a strong body and quickly earned a pinned down first squad position. In just 3 years after he signed for Parma, Buffon was awarded his first cap for the Italian national team, in a FIFA World Cup match against Russia (he replaced Gianluca Pagliuca who was injured). 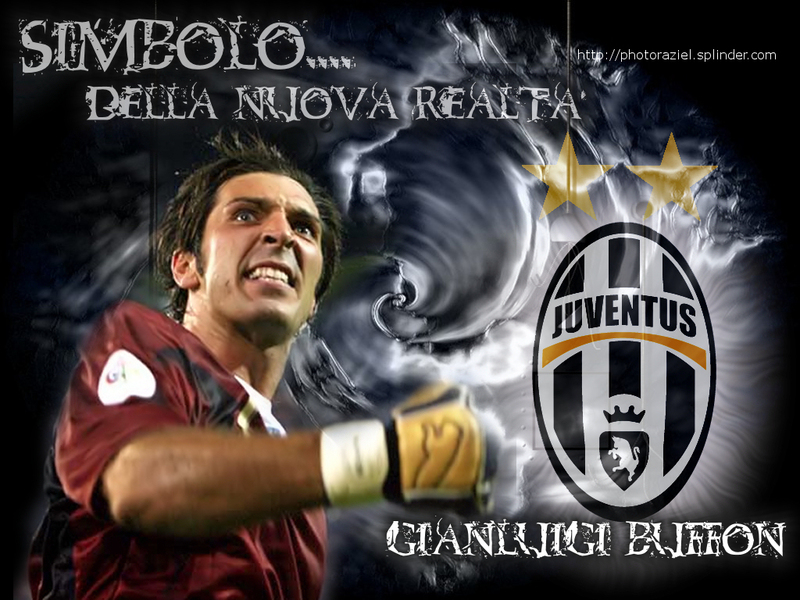 Gianluigi Buffon Biography – Juventus Torino - Although playing well for Parma, his place in the national team wasn't certain and he had no real trophy winning perspectives by playing for the mid-table club. Fortunately for him, big guys Juventus Torino always had a good taste for world class soccer goalkeepers and took out of their pockets what was at the time (2001), the biggest transfer fee for a goalkeeper, namely 32 million euros. Juventus is more than a soccer club, it's a warranty of quality for the players the team employs. It was the case for Gianluigi Buffon, who kept on having great performances for the new club but at the same time, he also won the battle with Toldo for the place in Italy's goal. Since then, he has been a constant option for his national team and his club and showed what Juventus fans appreciated as honor and loyalty when he didn't leave the club after the Calciopoli scandal in 2006, when his team was relegated to the second division. Gianluigi Buffon – Career Highlights - Starting with 1998, Gianluigi Buffon became a World Cup goalkeeper and has since played in two more World Cups, winning the one in 2006. Despite the World Cup title being his most valued trophy up to date, he has also won the "Best Goalkeeper" and "Most Valuable Player" awards in 2003, at the UEFA European Football Awards. He was also nominated on Pele's "125 greatest soccer players of all times" list, which was a huge honor and an "award" with a good amount of sentimental value. After all, it's not everyday your name gets nominated on the same list as Alfredo DiStefano, Maradona, David Beckham, Cruyff or Platini.